My latest sweater, the one from Cabin Fever's Need A Circular Yoke? book, is finished. Excuse my immodesty, but it is perfect. The fit is superb. Of course, 'atta girl, Brenda, that is partly my responsibility. I had to choose the correct size and shape for my body and my shape. 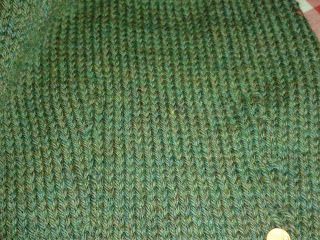 And of course I had to do a gauge swatch to ensure that the actual knitting matched up correctly to my plan. But mostly I give credit for the great fit to the pattern. In the NACY? book, there are opportunities to maximize correct fit. Bust darts, waist shaping and hip shaping play a role in getting that fit just right. Then, there are other options that I will call fit-to-flatter options(with apologies to any other designers who may have coined that phrase). Options like choice of neckline, sweater length, sleeve length and trims. Choices in these categories can really make a sweater flatter or fail. In my case, I like what I chose and think it flatters nicely. Sorry about the self promo here. 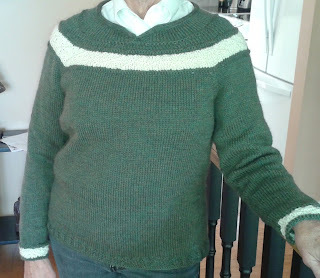 Pattern: From Need A Circular Yoke? I chose a Mandarin neckline, raised Ridge transitions rounds, and only one panel of decorative yoke design. While you have your nose in my armpit in the above photo, you might notice what a nice job I did of eliminating the curse of the top down -the underarm holes. I have a tip for that. 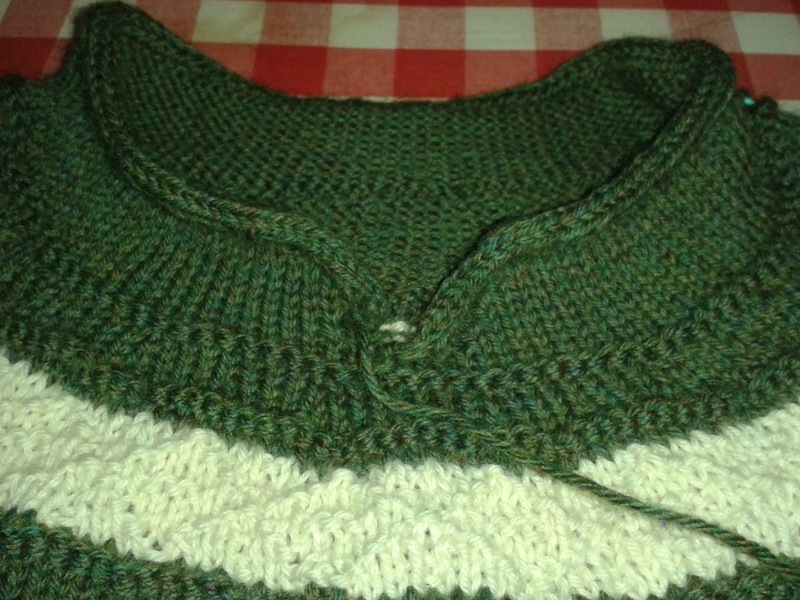 When adding the underarm stitches as instructed in the pattern, add two extra. 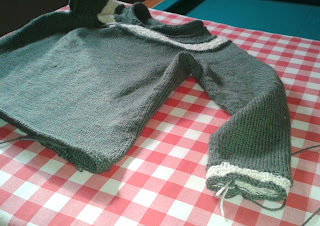 Then on the first, body round following the divide, at each side of the underarm stitches, knit the body stitch closest to the extra stitch together with that extra underarm stitch. In a pattern, that would read "Work to one stitch before the underarm stitches. 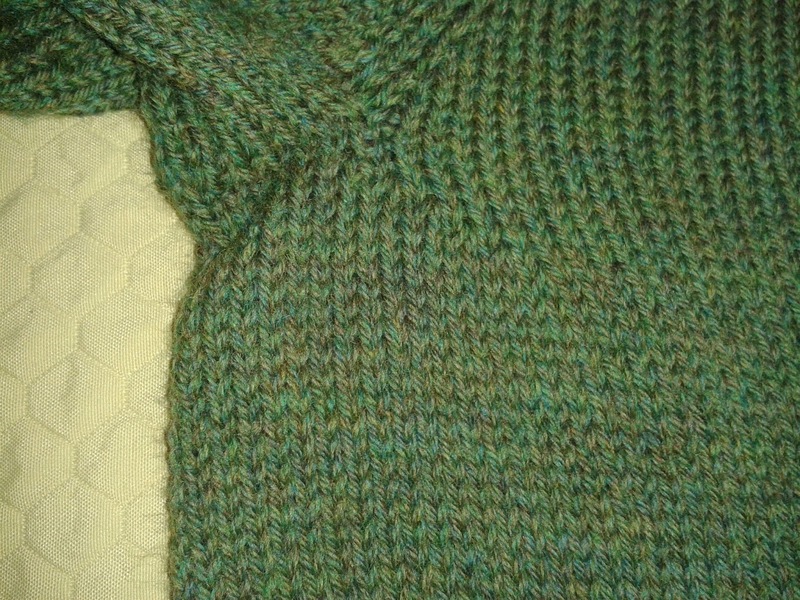 Knit two together (the last stitch from the body together with the first stitch from the underarm. 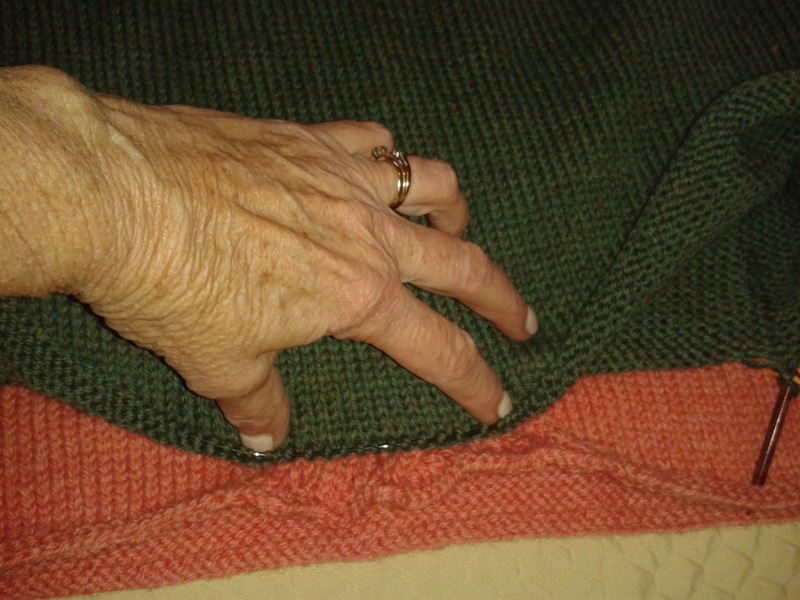 Work across the underarm stitches to one stitch before the last underarm stitch. Knit two together, being the last underarm stitch together with the first stitch from the body. Closes up that hole quite nicely. You're welcome. And I also added both waist and hip shaping. For me, I did one more increase round for the hips than the number of decrease rounds that shaped the waist. You can see the shaping was done on either side of the underarm stitches line. I like them that way. It seems more tailored. 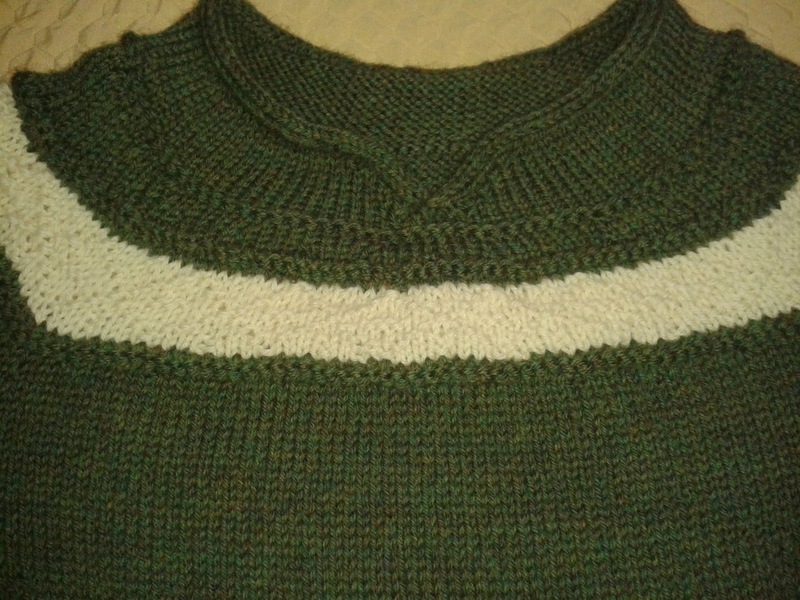 Needles: 4.5mm for the entire sweater, trim included. The exception to this is the Mandarin Neckline where I used needles 2 sizes smaller as per the pattern instructions. Mods: Personal Design Elements: NACY? encourages personal design. Choose a neckline that suits and flatters. Do the same with the transitions rounds - rounds where the yoke increases are done; the number of yoke panels and what pattern goes in the yoke panels. As well, chose whether or not to put in body contouring shaping, choose the length of the body and of the sleeves and finally choose the border trim. The pattern guide give multiple choices for all these options but of course most knitters have many more available either from their heads or their knitting library. The list is endless. Really, for the NACY? patterns, I would say - 'mods' is a category that doesn't exist. 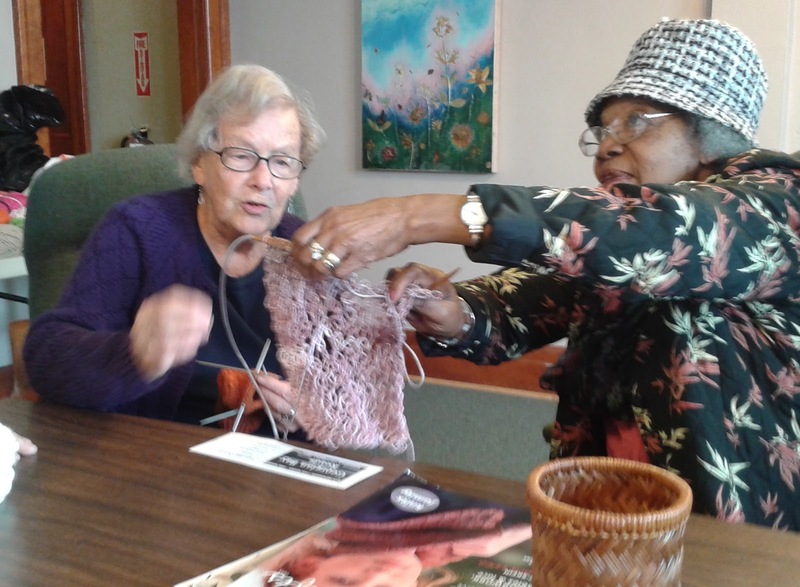 The knitter is expected to share in the design process. 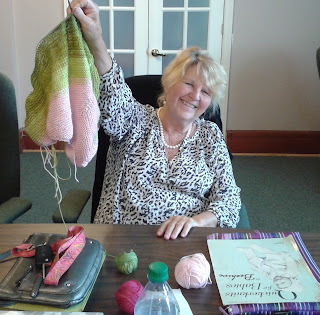 Perhaps not a process that suits all knitters but for me, that is FUN! Loved the process. Love the product. 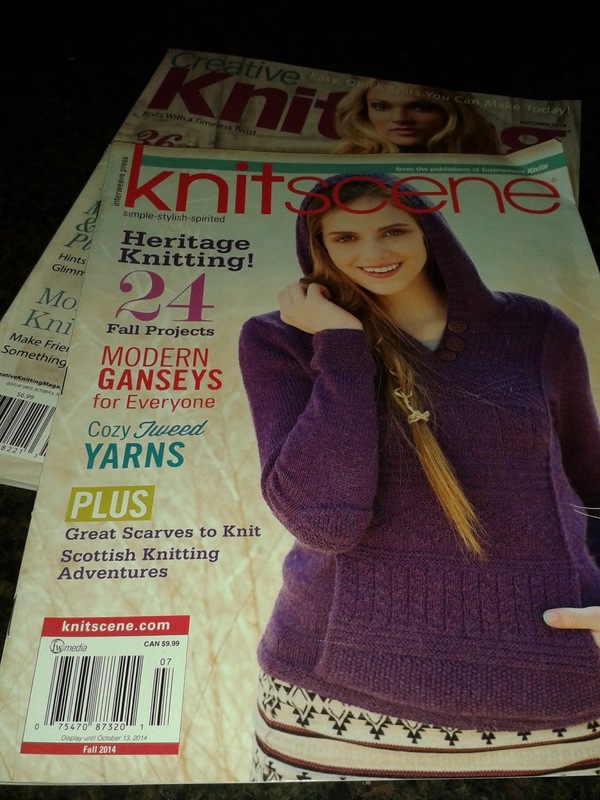 That's a win win in a knitters world. I didn't know until this afternoon when I walked up the street to the library. Someone had written it on the sidewalk. It is Ontario Public Library Week. Meaford Library is small. Too small really. Meaford library is old. Too old really. But it has a heart the size of Texas. 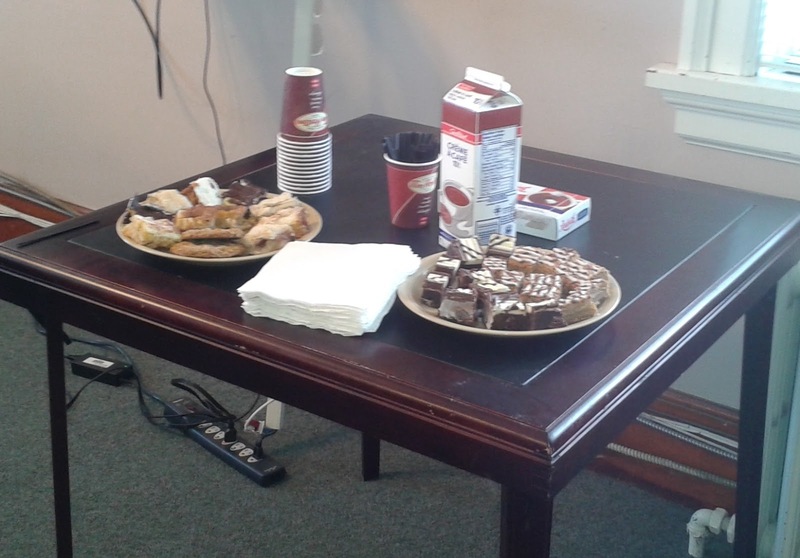 Today, right inside the front door, was a table with coffee and goodies. To celebrate Ontario Public Library Week, the staff had provided these treats for all library patrons. 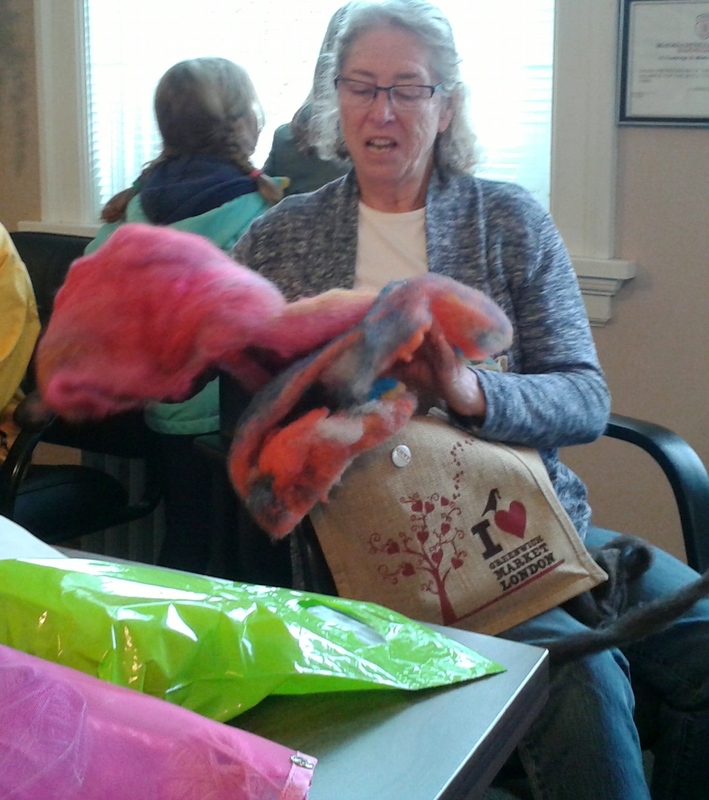 Upstairs, we weren't long at our needles when two of the librarians visited, bringing goodies just for knit group. 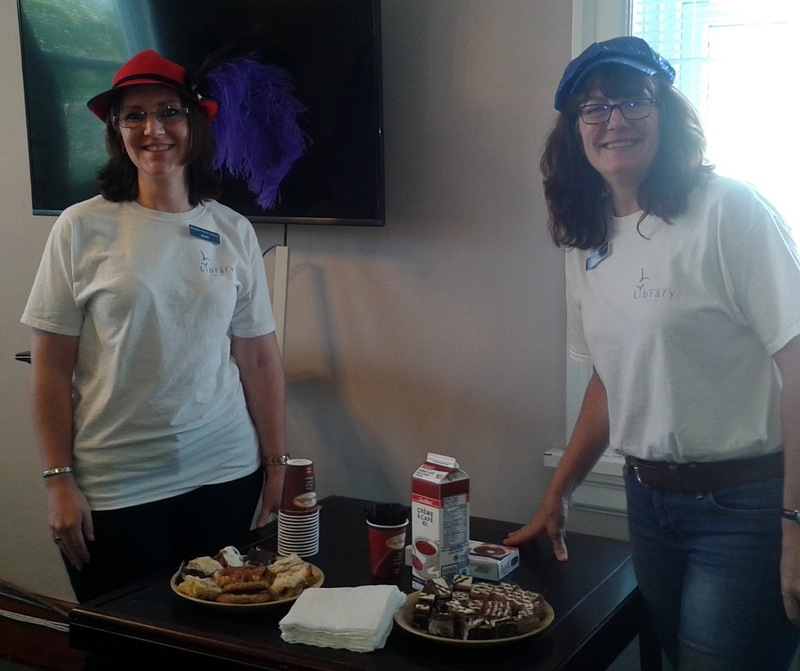 These aren't your Grandma's librarians, that's for sure. Thanks ladies. Sandy, still cleaning out her yarn room, brought more magazines again this week. They were to be recycled either to us - or to the 'box'. and might go back for more if they are still available next Thursday. 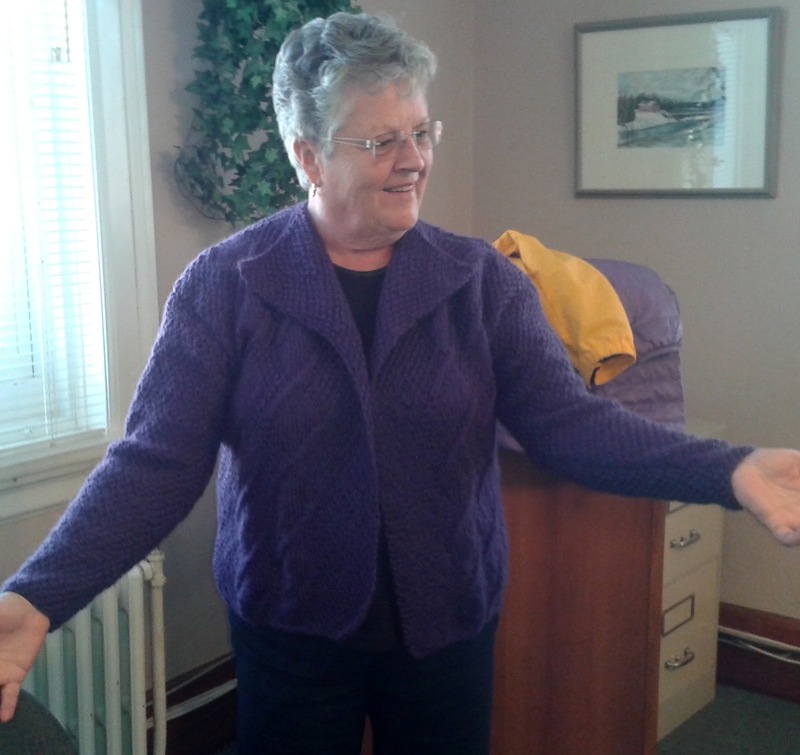 Gail brought her purple cardi today. She finished it last spring and has been waiting for cool fall weather to wear it. 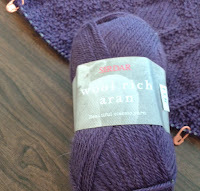 knit with this Sirdar yarn. Gail's sweater is gorgeous. Beautiful back. And beautiful front. You appear pleased, Gail. As you should be. 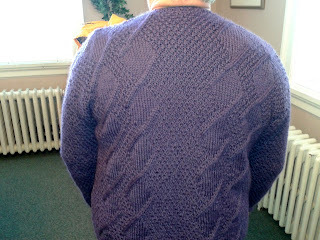 Gail has decided to not put the button on the front as shown in the pattern. She prefers the open jacket look and is nervous of the garment pulling if buttoned as does the one in the pattern photo. The simple, unshaped, front neck creates lapels. Isn't that cool? Goodies. Give-away magazines and a great fashion show. Nice Thursday afternoon. 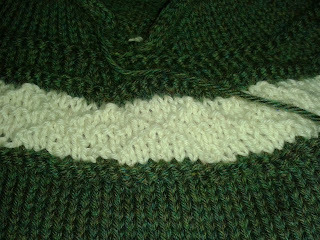 My circular yoke sweater is moving along nicely. Even sleeve island hasn't seemed overwhelming. One sleeve finished and number two begun. 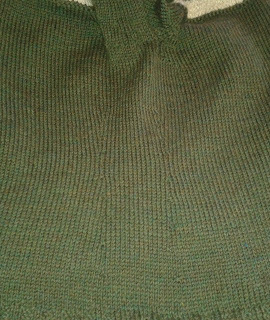 The same panel of cream coloured stitch pattern that I placed on the yoke, I have also used for the sleeve cuff. The sweater needs the cream for a couple of reasons. 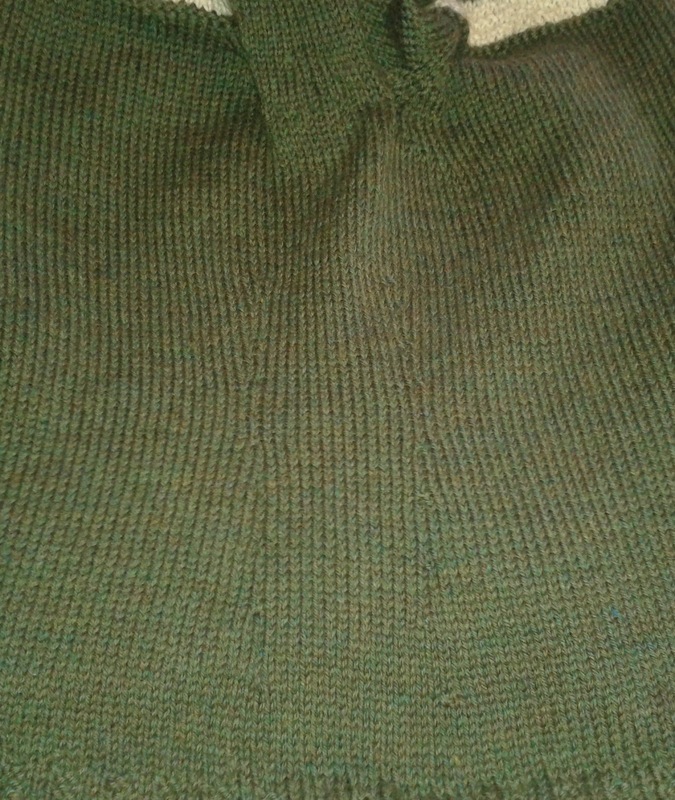 It makes the dark teal pop and also ensures that it matches the skirt I plan to wear with the sweater. But to have it only on the neck, I thought, would make it seem less special than it could be. 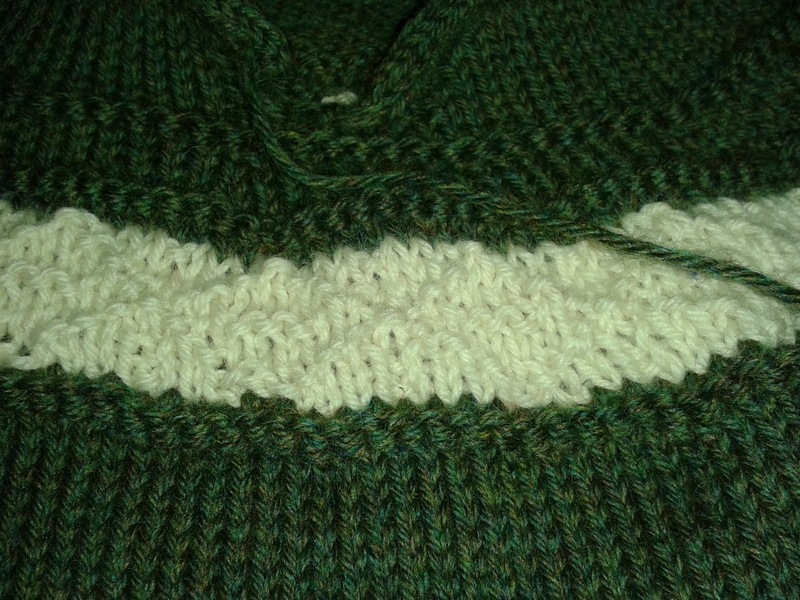 Placing the cream in two locations gives the sweater the well-planned look I am going for. So yoke and sleeves it is. 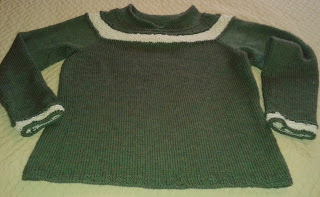 If I can finish this one before November, I should have time to knit my niece's Glenora plus the Christmas sweater I hope to wear this season. It's good to have goals. and wasn't surprised to see many others took advantage of the cooler weather to bring out their woolies. 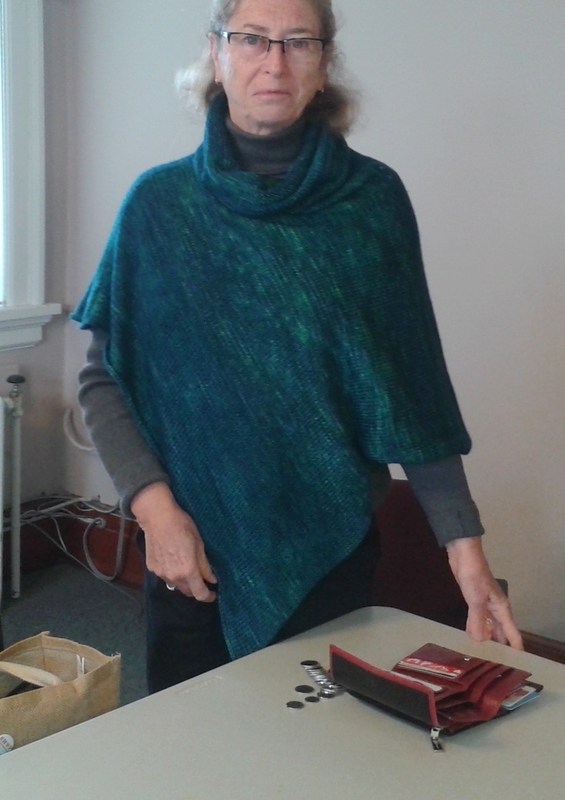 Sharon was wearing a great wool poncho. 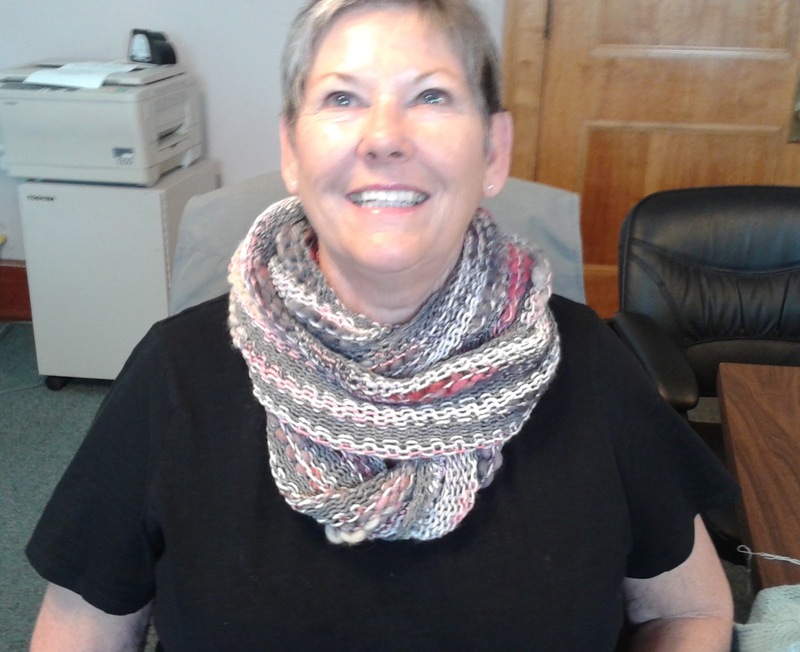 With a warm and cozy, cowl collar, it is perfect for fall. Doreen has miles of scarf to keep someone warm. 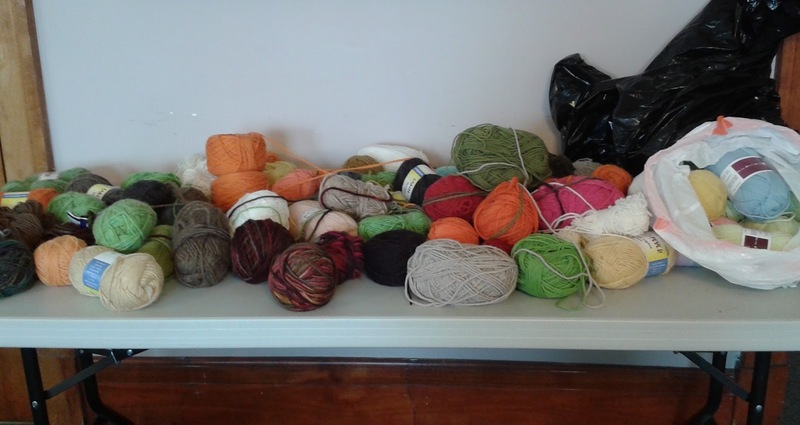 These several yards of scarf all came from one ball of yarn. Still more to come. 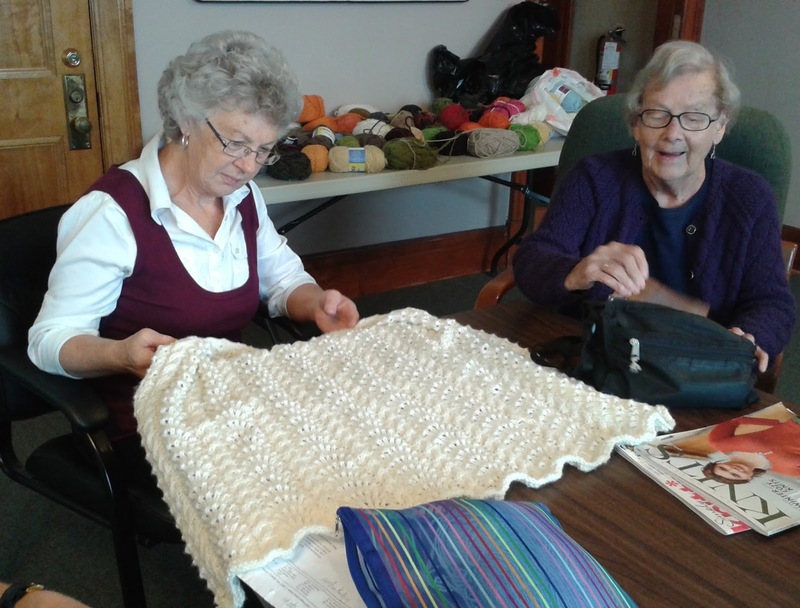 This scarf, Doreen will donate to the hospital for their annual Bazaar. Wilma finished the gorgeous scarf/shawlette with the wool her daughter brought back to Canada from her year in Malaysia. This is a beautiful piece. 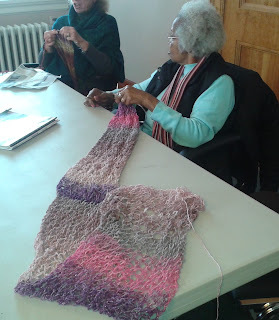 Great colour, great knitting. Jean's getting ready for the November Spinners show with these little socks. Two little socks on two circs. Aren't they cute? Carol didn't have a good knitting day. She ripped more than she knit. When you are working on something like this scarf, with it's very geometrical lace pattern, mistakes are easily seen. No fudging here. So rip it was. She's back on the right track now. The forecast for our area calls for chilly temperatures on the weekend. A knitters favourite forecast. Layer on the woolies, people. followed by Peterborough for Thanksgiving. Home one day for 'prep' because we had Hearst friends coming to visit for a few days. The good news is that with all that driving, I accomplished lots of knitting. My NACY? pullover is almost at my desired length. 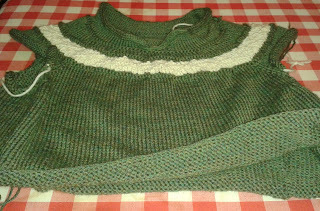 I show it here against My Valentine, knit earlier this summer. I think NACY? will have the same border as My Valentine. 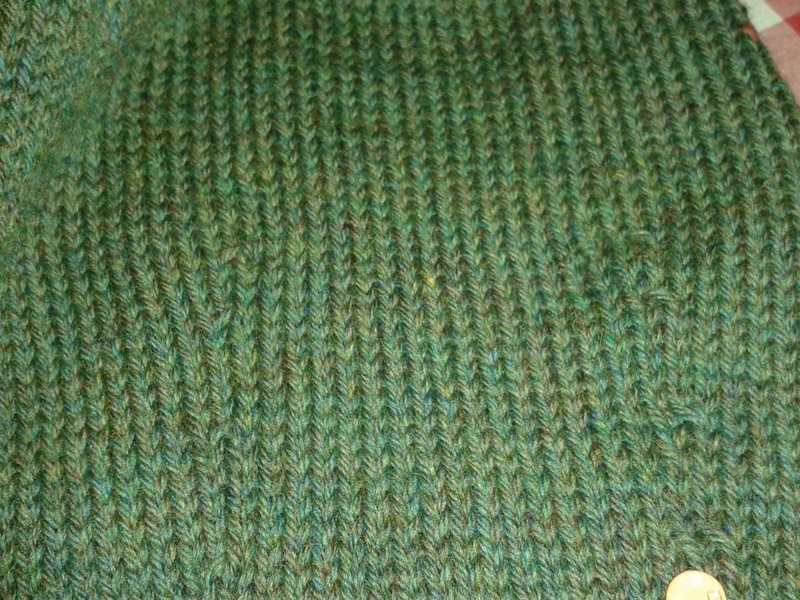 A simple garter stitch trim which lies flat and isn't too bulky around the hips. 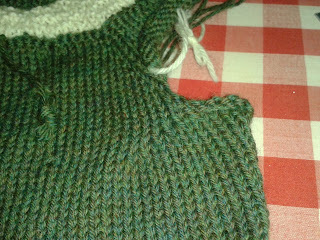 Once that is finished, it is on to the sleeves. Hopefully they will fly by as quickly as the rest of the sweater. I now need to finish this one in a hurry as I've had a request. My niece for whom I knit Hippie Blue last year about this time, has requested another sweater. She saw Glenora at Thanksgiving and loved it. A maroon Glenora is her request and I am happy to oblige. Just as soon as NACY? is finished. In striving this year to use up stash and knit sweaters long in my queue, next up after Glenora, is this beauty. From Cabin Fever's Need A Circular Yoke? book, (in my knitting library for only one year) and knit with Cascadde 220 ( in my stash for only ten months) it has been, so far, a really fun knit. and if you choose, as I did, waist and hip shaping. Fun! My neckline, The Mandarin, I chose simply because it was new to me. 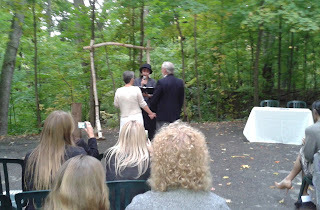 It is an I Cord of sorts and quite attractive, I think. Next I chose the Ridged Transition style for the increase rounds as it most closely matched my Mandarin Neckline, I thought. Look closely and you will see the Ridged Transition Rounds (increase Rounds) in the darker colour, above and below the cream colour section. For the decorative bits, I chose only one panel. I wasn't so much looking for the traditional yoke appearance for this knit but I did want both the dark and light colours in my sweater. My decorative round is worked in a textured pattern of knits and purls and done in the creamy off-white. All of the above were choices I made. No pattern dictated to me what had to be done. Instead I chose what pleased me most. Sure, it required more reading of the instructions but in the end a much more satisfactory result for a knitter like me. After a week or so of knitting, I am starting the below-the-waist increases for hip room. Then on to sleeves. Not only fun, but quick too. 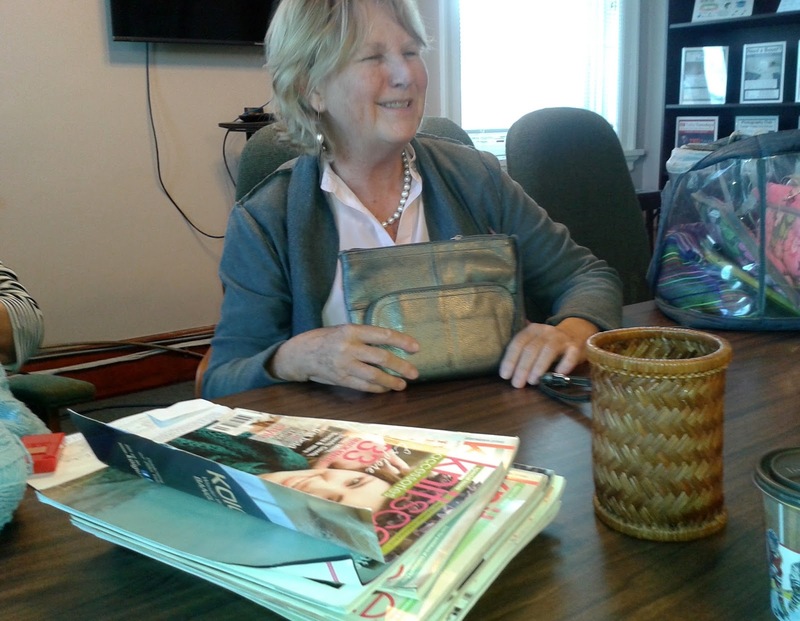 Sister Sue buys high-end yarns. Cast-offs from Sue in my colours? Yippee. But, I was expecting a few balls. 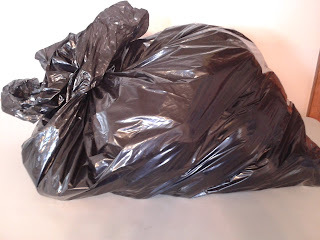 Perhaps a small grocery bag of balls. I sure wasn't expecting this. Holy yarn, Batman. That is one heck of a lot of cast-offs. Remember, everyone else got their fill last week. These are what Sandy set aside for me. Thank you Sandy for carrying this bag back and forth for two weeks in a row. 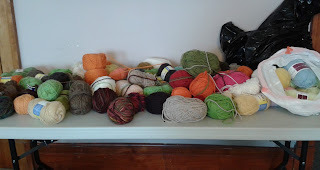 And thank you Sue for the great yarn give-away. 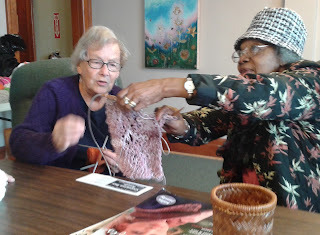 Ruth, examining poor Doreen's scarf disaster (she inadvertently pulled out the needle) is wearing a sweater knit with yarn from Sue's 2014 great yarn give away. 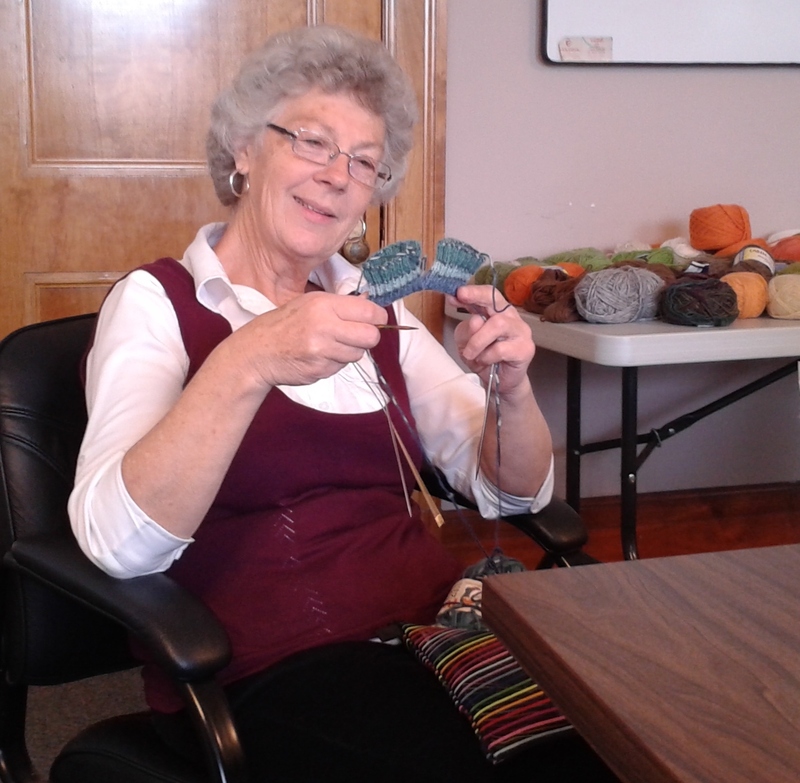 Your yarn lives on, in Meaford, Sue. 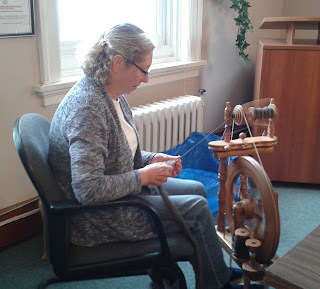 Sharon brought her wheel to knit group today. It is a special, spin-in-public-time for spinners. Sharon had some brown fleece on the wheel but showed off her brightly coloured fleeces from Custom Woolen Mill purchased while on a summer vacation in Alberta. Wilma wondered if her baby blanket was large enough. She is ready to move on, she said. 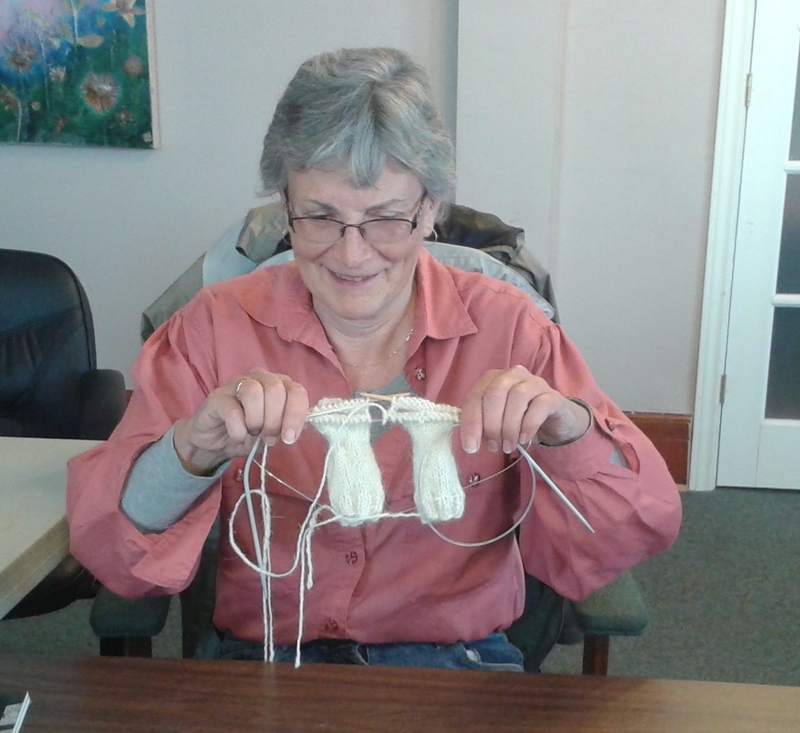 Last week, she had Jean show her how to knit two socks on two circs. Wilma said her personal jury is still out on whether she enjoys this new technique. She will enjoy having two socks finished at the same time, for sure. 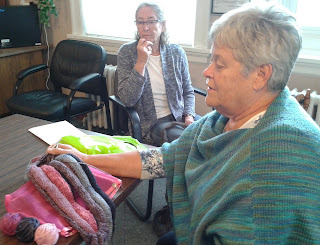 Quite a few of our knitters are still showing off knits from their Knitters Fair purchases. 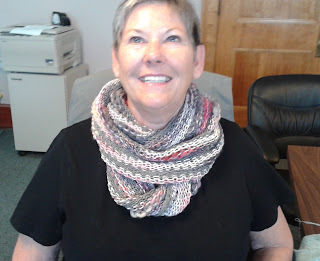 Sharon R has a lovely cowl. Intended as a Christmas gift, Sharon thought she should try it out to make sure it works. 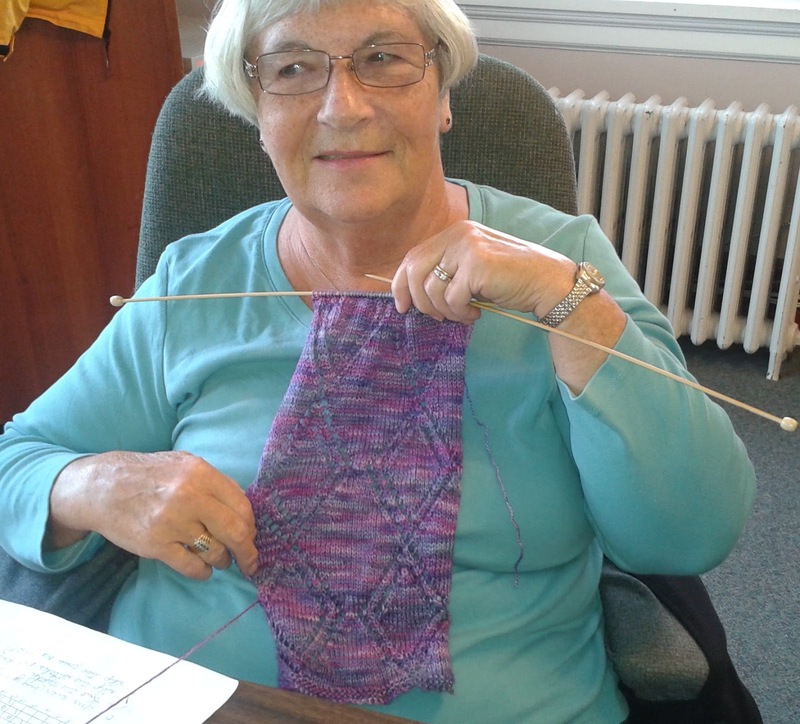 Deana is almost finished her colourful cowl. 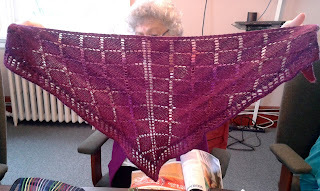 And Sandy has another - you guessed it , shawl - almost finished with her Knitters Fair yarn. Such a lot of yarny goodness. I love Thursdays.